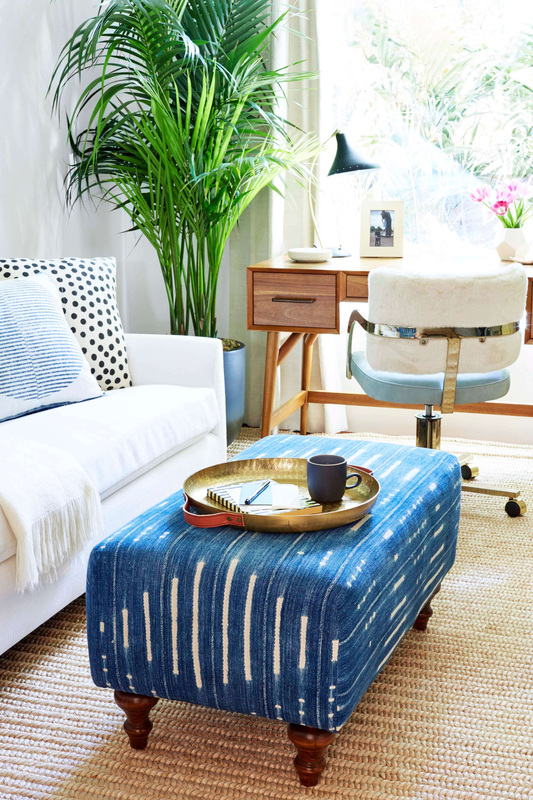 Hey there, this week I’m bringing you a double home-office reveal. We were approached by a very cute husband and wife couple in Mullholland that needed help with their individual home offices. Today, I’m showing you what we did in her space. 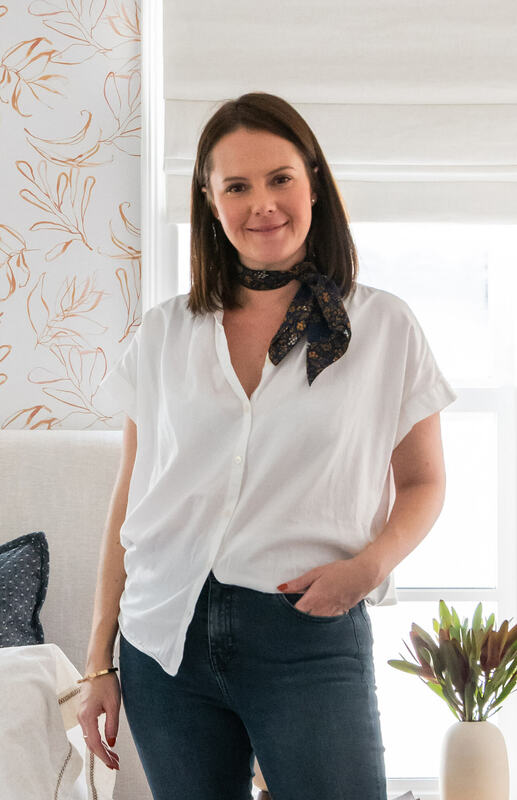 She wanted to make the room feel more like ‘her’ while maintaining the integrity of their mid-century house. She wasn’t tied to anything in the room, which meant we had full reign to do whatever we wanted. 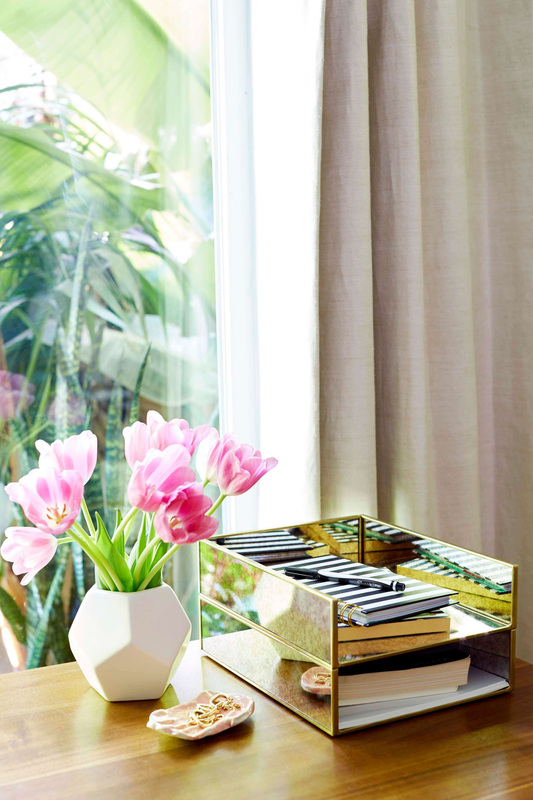 Her existing desk was beautiful, but was way too big to be in the room with a sofa. 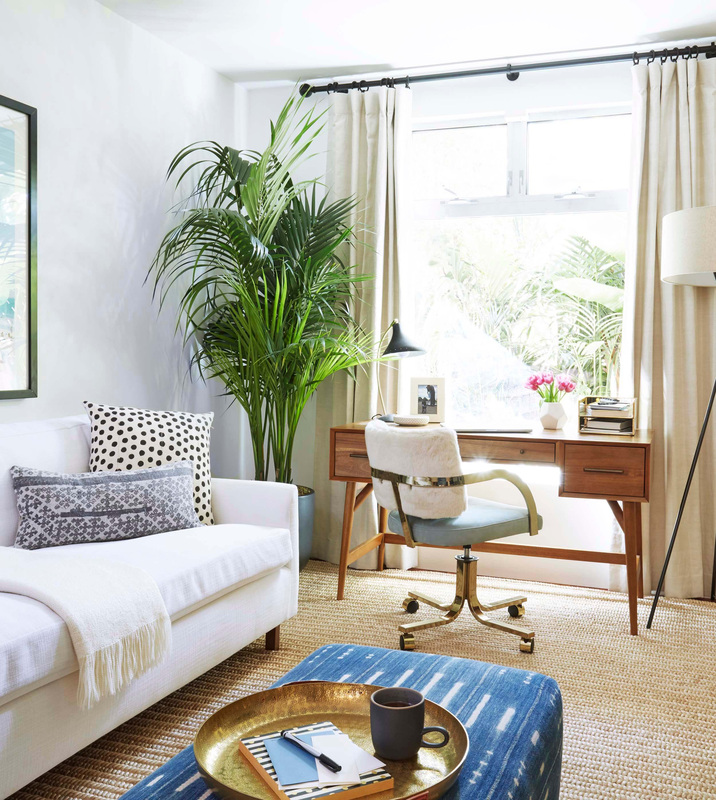 She spends a lot of time in here reading scripts (she’s an actress), so wanted to keep a sofa or replace it with a big comfy chair and ottoman, making the space feel more loungy. We started off by pulling together some moodboard options to help start conversations about what she wanted in the room. 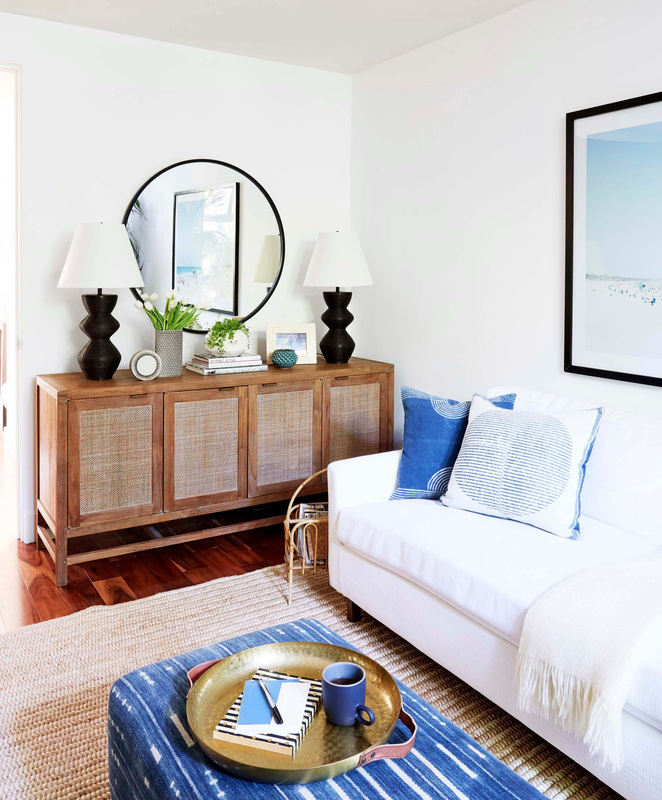 From the inspiration images she showed us, it was clear that she wanted a room that felt bright and airy, warm and layered. Since the client was having a hard time visualising what she liked, we ended up doing quite a few different options. We sometimes find with clients that they think they know what they want and it’s only when we get deeper into the process that their minds and tastes begin to change and evolve, or become more clear. It’s a pretty common thing, which is why they need us to guide them in the right direction. 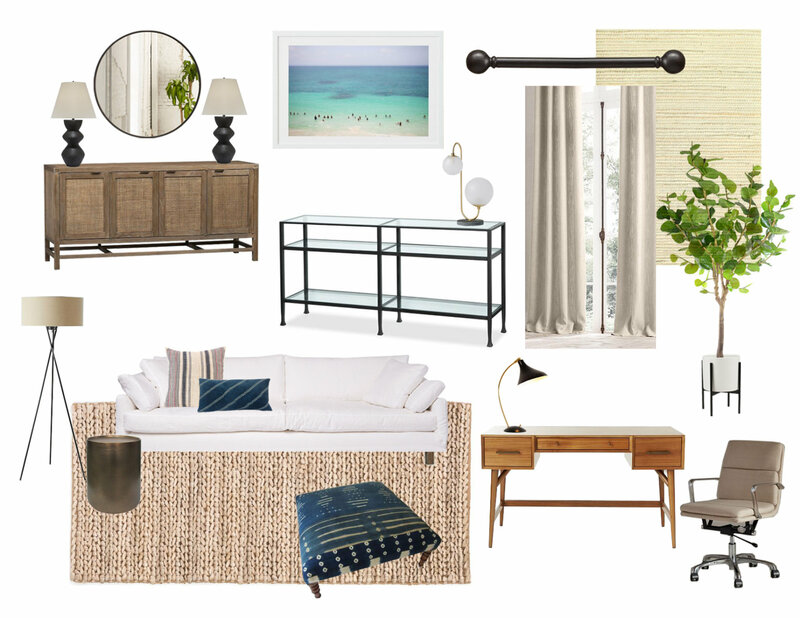 You can see from the moodboards that we were proposing a fairly neutral palette with blue tones and black accents, giving it a beachy, mid-century vibe. This is the moodboard that is closest to the design for the main pieces of furniture. And here is the end result. You can see that we completely changed the layout of the room. We moved the desk against the window wall and the sofa against the longest wall (opposite the TV). It really opened up the centre floor space allowing for a coffee table. 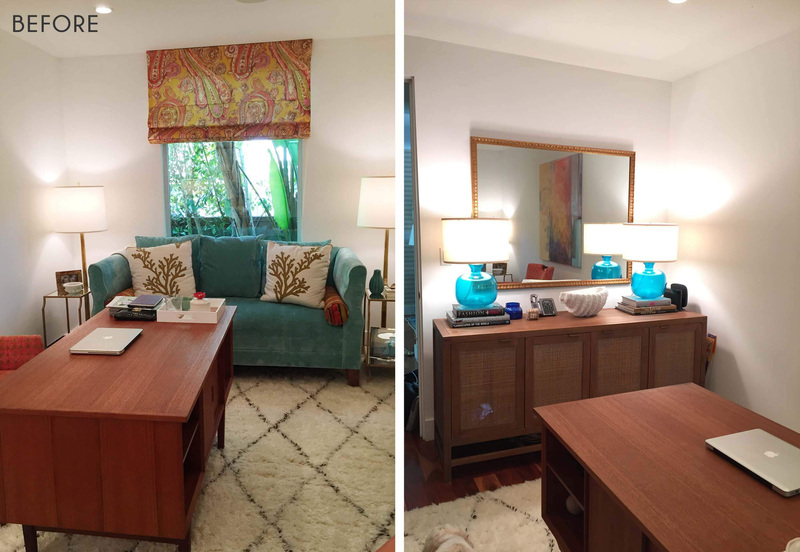 We removed the patterned shade and replaced it with simple linen drapes from Loom Decor. This helped to frame out the window and make that back wall feel much grander. The existing shade also covered up part of the window, which blocked some of the light, so adding the drapes and moving the desk allowed more natural light in. 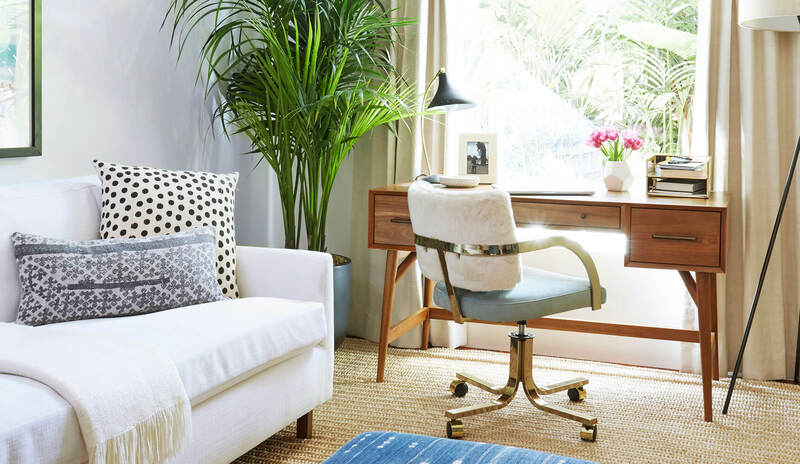 We started off by replacing the Moroccan style shag rug with an Abaca area rug from Serena & Lily. 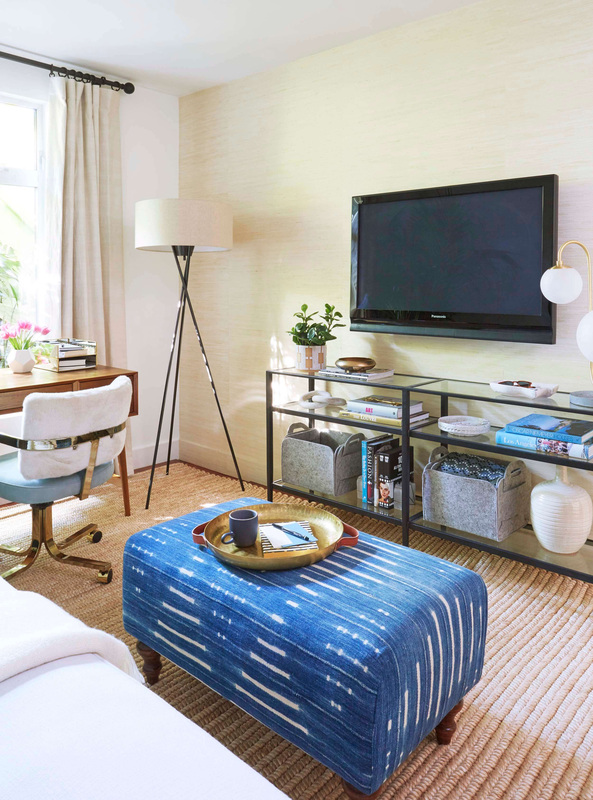 There was talk overlaying a more patterned rug on top – and we did try out a few vintage Kilims – but the client decided against it. Instead, we worked with Clad Home and had a custom ottoman made using a vintage indigo which helped to bring in some colour and pattern. Since the client likes to move around the room, sitting on different surfaces, we thought it might be nice to do that instead of a ‘hard material’ coffee table. We opted for a mid-toned turned wood leg to contrast against the rug. This might be one of my favourite pieces in the room. 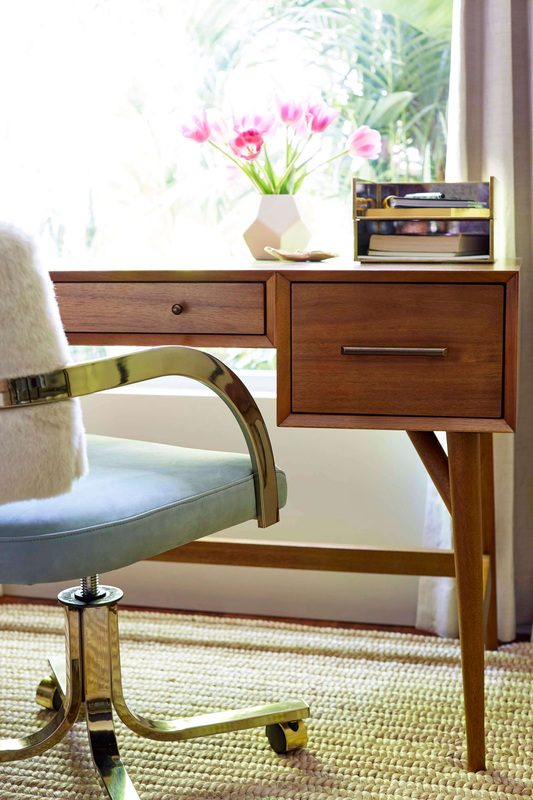 We scored this brass vintage chair that already had the upholstered faux fur back, which we loved. The seat pad was in a white faux leather. It was a little grubby, so we switched it out to a duck egg blue leather which is so soft and velvety to the touch. 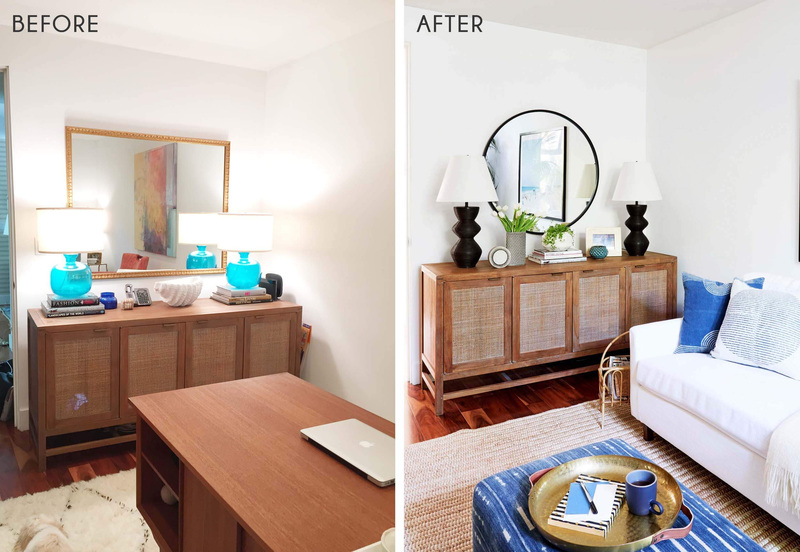 We used the good ole West Elm desk – which is a lot smaller than what she had – but it still had drawers for storage. 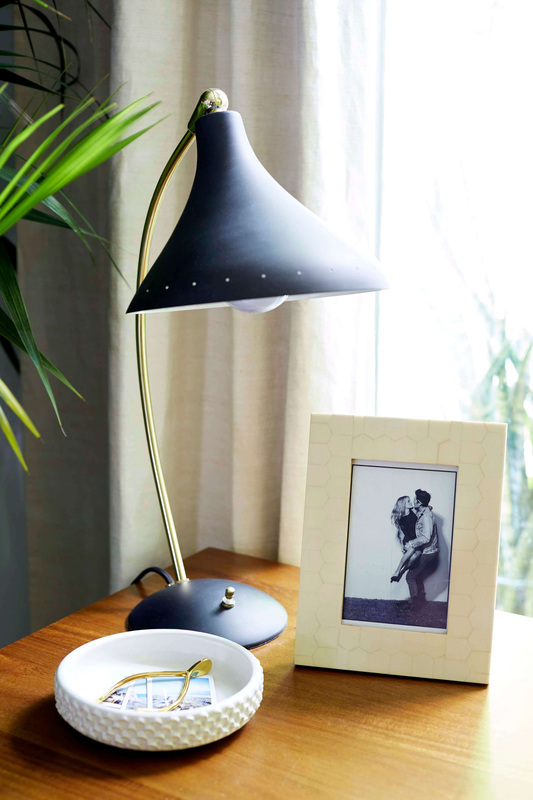 We brought in this cute task lamp from Rejuvenation for the desk, which combines our black accents and mid-century styling. We ended up keeping the media console since it was fairly new and went well with the overall concept. 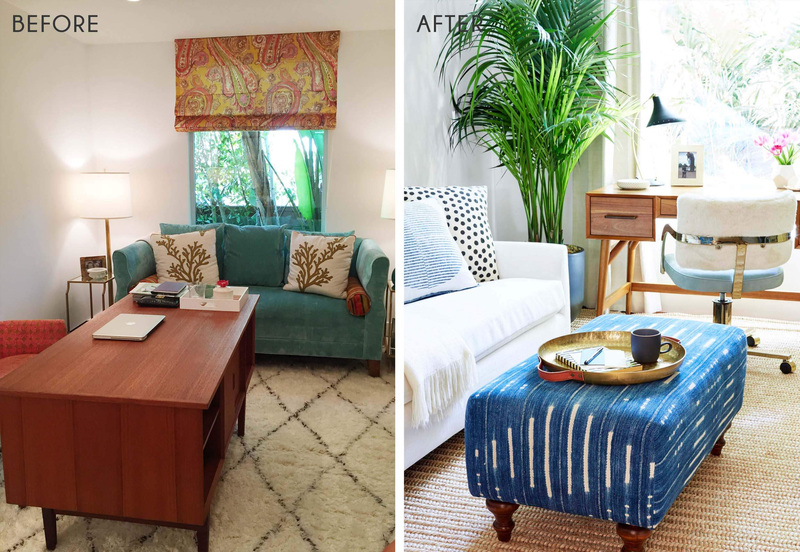 The client had a hard time deciding on a sofa so we had this custom made again with Clad Home – they’re really easy to work with and have lots of different fabrics and styles and will custom design things too, so if you’re in LA you should check them out. We went with a very simple shape with one long seat bench and two back cushions, slim arms with an inside waterfall edge and straight wood legs. With us opting for a white fabric, we did the sofa in a slip cover so she could remove it and get it cleaned easily. You might have spotted that we switched around the same 4 pillows for different shots (some formations work better than others in different angles when shooting). 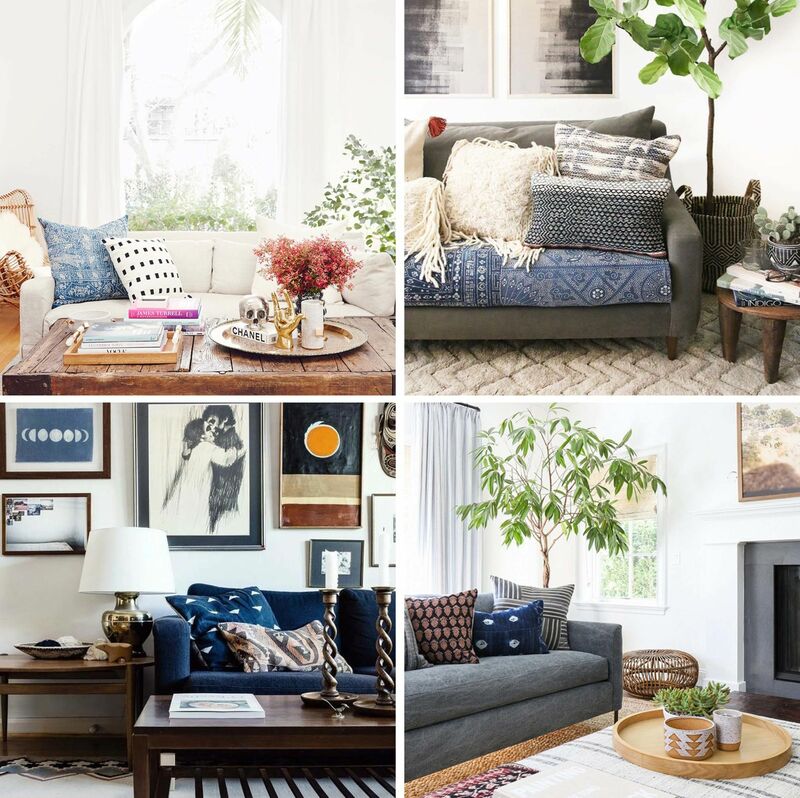 But the client does have all 4 of these pillows and each of them are amazing. 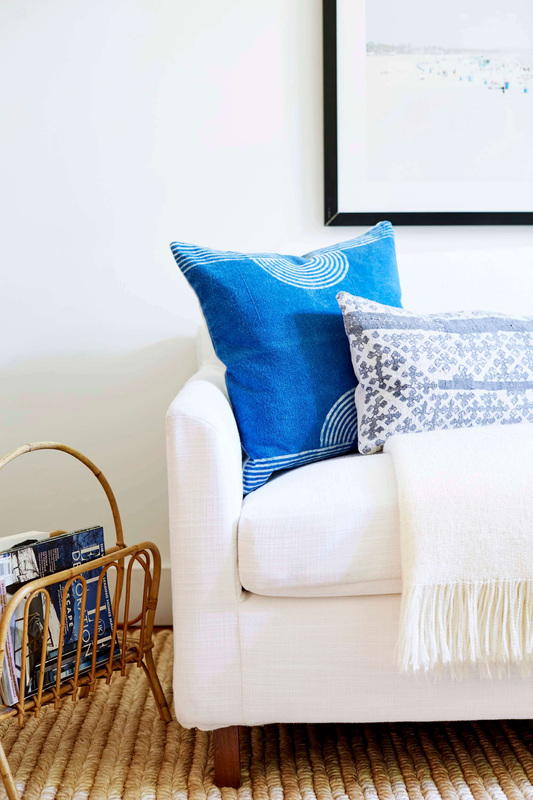 The two indigo blue ones are from Block Shop Textiles and the other two are from one of our favourite LA store, Nickey Kehoe. 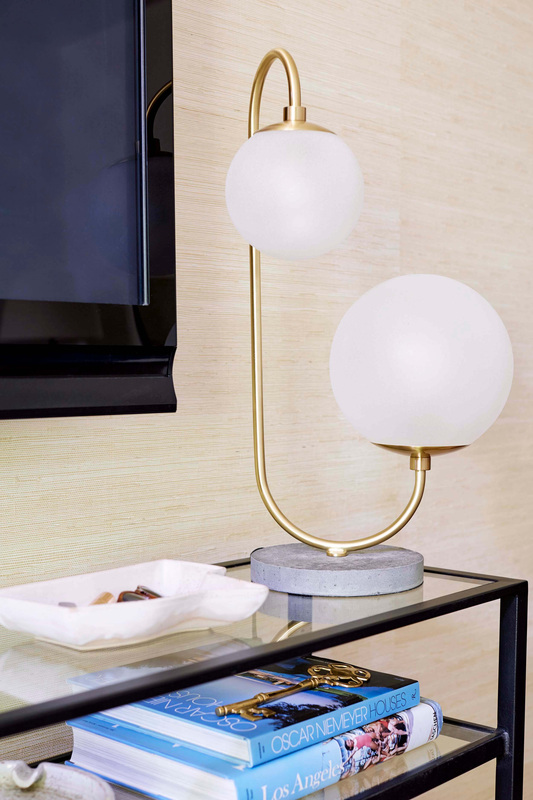 We waited a long long time to get these Kelly Wearstler lamps, but they were well worth the wait! It also took me a long while to get under the skin of the type of lights the client wanted and it finally came down to texture. Not only are these an interesting shape, but the iron material itself has a textured line detail. Which the client LOVES. 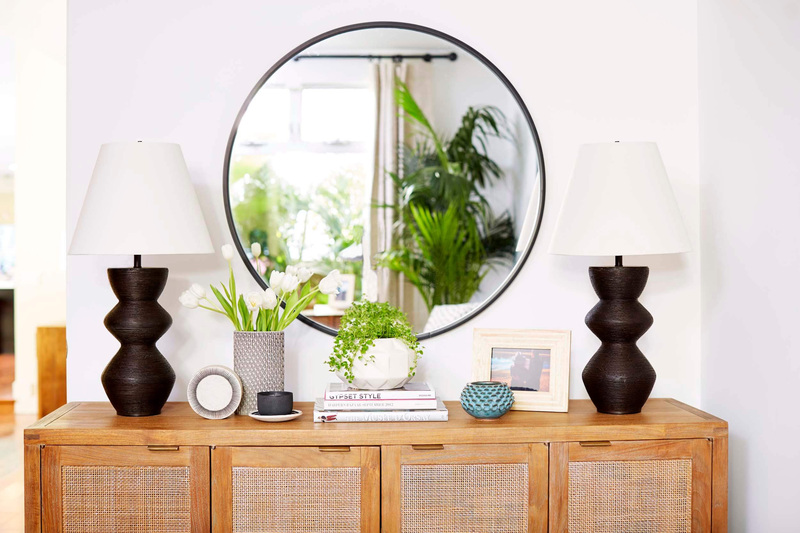 The big round mirror helps to bounce light around the . 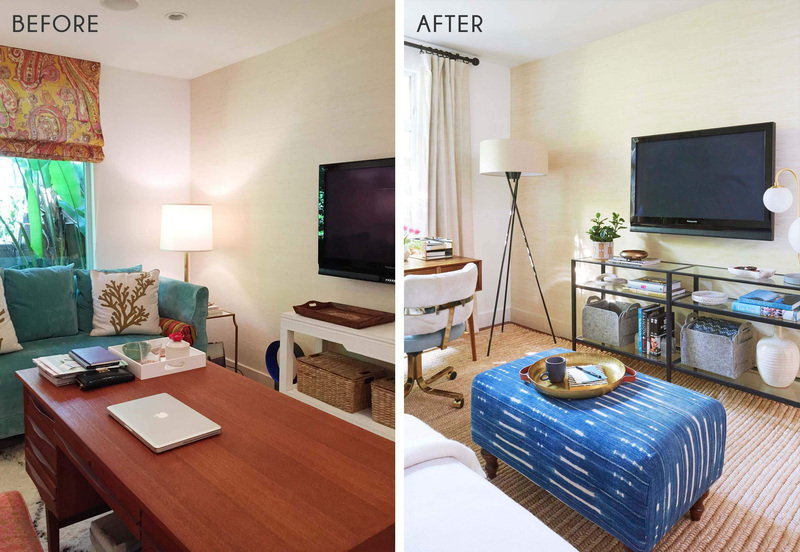 The client already had a piece of furniture under the TV, but we swapped it out for a larger console that contrasted against the grasscloth wallpaper better. 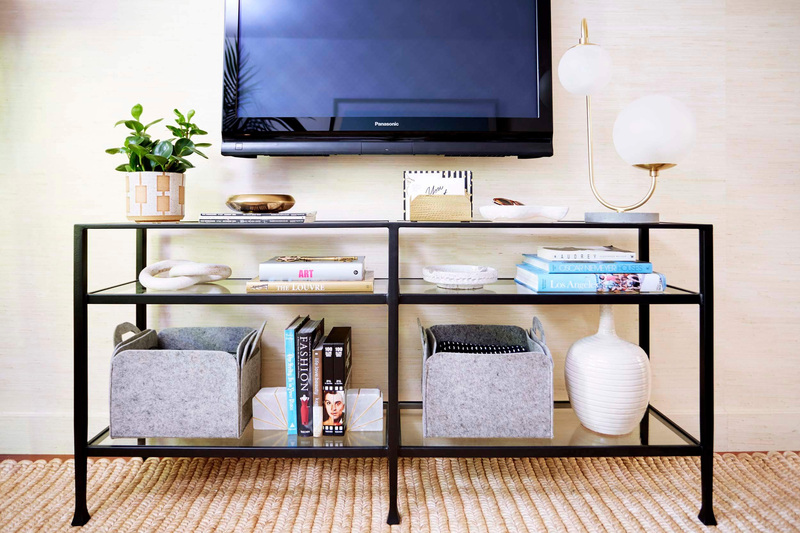 She didn’t need much in the way of storage, so we used the two felt baskets for anything that she needed to hide away. The wallpaper itself was already installed on the one wall and is featured around the rest of the house. We decided to keep it and just freshen up the remaining painted walls.